It’s easy to get into a rut when it comes to healthy eating. So today I’m sharing 12 ways to add some leafy greens into your daily diet. I’ve sung the praises of leafy greens before, so today I’m going to focus on the how instead of the why. 1. 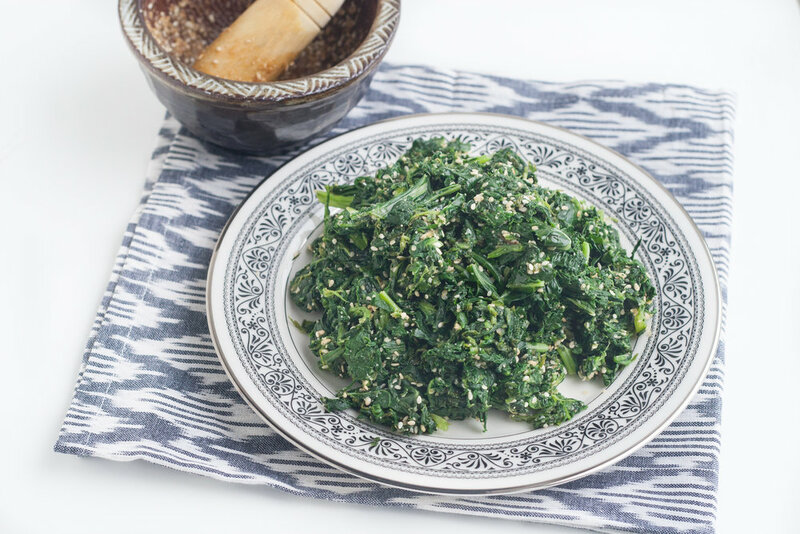 Combine leafy greens with sesame seeds and Japanese seasonings. Boiled or blanched spinach gets a huge flavor boost from simple seasonings like tamari, mirin, and sesame seeds in Spinach Gomae. 2. Massage leafy greens with lemon and olive oil and serve raw. A raw kale salad is fresh but also tender and digestible when the leaves are massaged by hand into the dressing. Serve with something crunch and something sweet like in my Kale Salad with Sun-dried Tomatoes and Roasted Chickpeas. 3. Saute greens with minced ginger. Garlic is a great go-to, but ginger complements a lot of leafy greens, especially Asian greens like bok choy and Chinese broccoli. 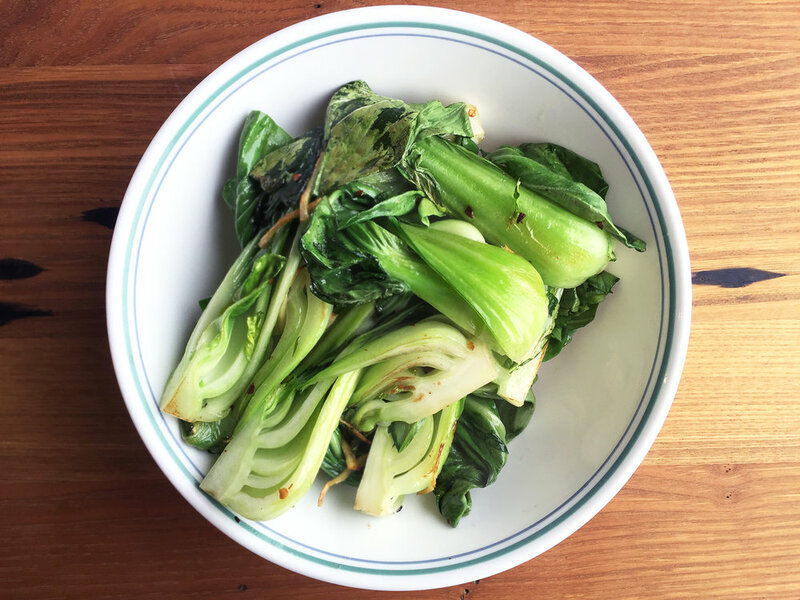 Try this technique in Gingery Baby Bok Choy. 4. Bust out the juicer and make a basic green juice. 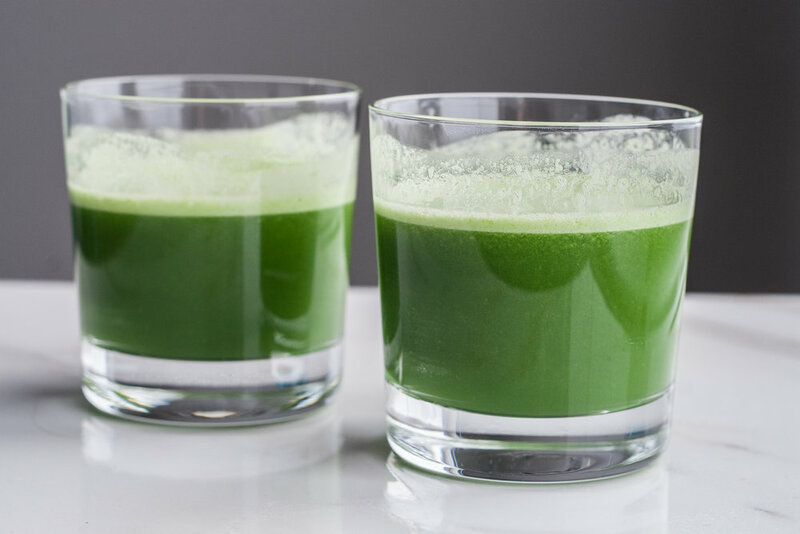 Add green apple, celery, and cucumber to make a Basic Beginner Green Juice. If you don’t have a juicer, use the blender and then a fine mesh strainer. 5. Use unexpected greens in a salad. 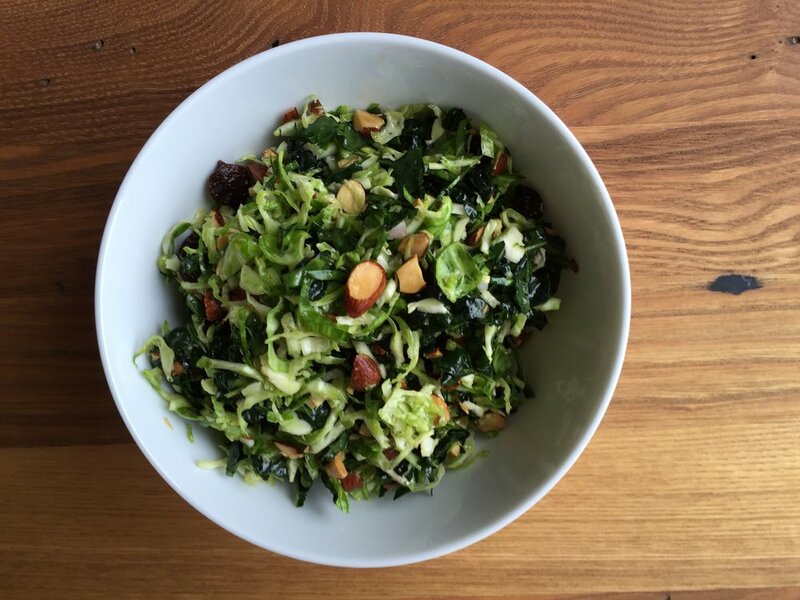 Use the food processor to shred up Brussels sprouts for a Brussels Sprouts Salad with Leeks and Almonds. The sweetness of leeks and currants counteracts the bitterness in the dark greens. 6. Saute greens with carrots. Strong greens like collards and dandelion greens need something sweet to balance them out. 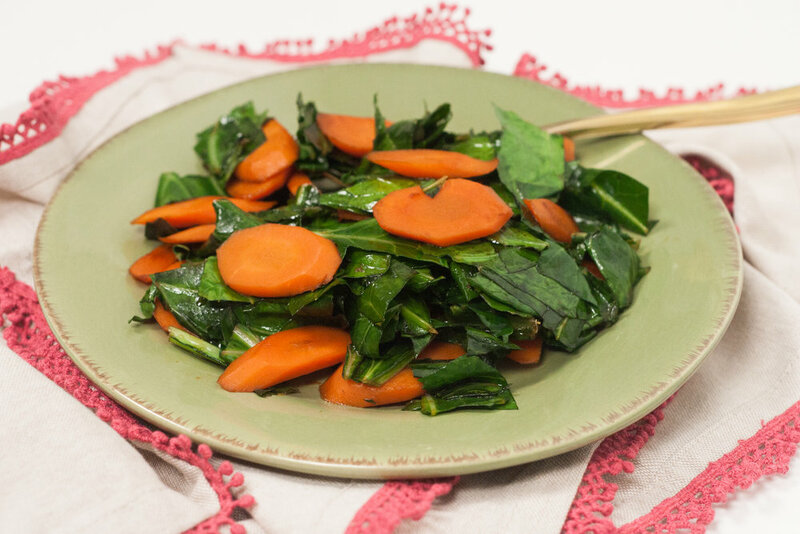 Try carrots or caramelized onions like in this Collard Greens with Carrots recipe. 7. Make a pasta salad with half greens and half pasta. Baby greens like spinach and arugula can lighten up a pasta salad like in this Spinach Walnut Pasta Salad. To pack up for lunch, toss the pasta with the dressing and then stack the greens on top. Toss the whole thing immediately before eating. 8. Pack up green smoothie jars for the week. Toss any oxidizing ingredients like apples or avocados with lemon juice and stack other veggies and leafy greens on top. I store these Clean Green Smoothie Jars in 32 ounce mason jars and then after blending, I pour the smoothie right back in the jar and take it with me. 9. Boil greens and top with your best olive oil. This method is inspired by one of my favorite Greek dishes: Horta. Take dandelion greens and blanch them, then top with lemon juice and extra virgin olive oil. A great way to make a batch of greens for the week. 10. Slow cook greens with Indian spices. Saag Paneer and Saag Tofu are great ways to load up on delicious leafy greens. You can even use frozen spinach or kale for this recipe. 11. Wilt greens into another dish in the last 2 minutes of cooking. Whether you are steaming, roasting, or sauteing, try throwing in 2 handfuls of greens in the last few minutes of cooking to add some freshness and contrast. 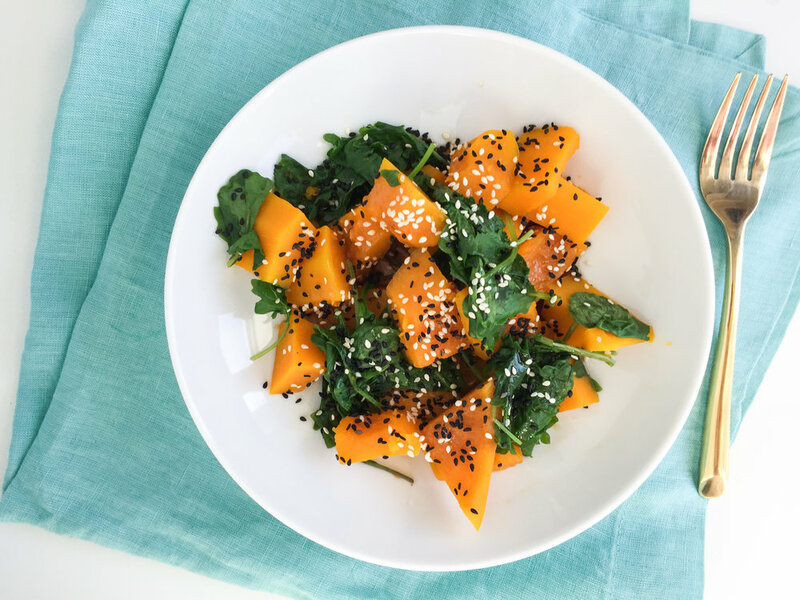 The steamer basket makes this easy like in Sesame Steamed Kabocha Squash and Kale. 12. Save leafy greens from spoiling by making and freezing Green Smoothie Cubes. Have half a bag of baby spinach left, but going out of town for the weekend? Use the blender to combine greens, water, and lemon juice, and then pour into an ice cube tray. These Green Smoothie Cubes will be perfect for impromptu smoothies weeks later. Have a favorite way to eat leafy greens? Please share in the comments below.